Let me start by acknowledging that DISH is not for everyone. It is the T-Mobile of TV service. it is the small, scrappy, low-priced alternative. Most likely, it will lose the war to bigger and better established competitors. It is only a matter of time. DISH also requires special installation. It is not just a matter of plugging a cable into the back of a box. Moreover, the Hopper requires even more setup. I was already a DISH customer when I upgraded to the Hopper. (In my case, it was a free upgrade.) They had to send out a tech to instal the Hopper. They had to do some additional work outside. I didn't bother to ask what that was all about. If you live in an apartment, this may not be an option. For everyone else, read on. As good of a second-screen as the iPad is, I would be remiss if I didn't talk about how good it is as a first screen. Though not a part of its native features, the iPad at any size, makes for an excellent TV. Content providers have ported apps that make the bulk of their offering on demand from the iPad. Services like Netflix and Hulu help to round out the content available for iPad viewers. iPad mini with Retina display, Smart Cover, and DISH Anywhere makes a great fridge magnet TV. Click to enlarge. DISH takes it a step further. My Hopper box has Sling built in. With the DISH Anywhere app, I can view my TV content from anywhere over any network connection. That means I can watch my recorded shows, On Demand content, or movie rentals on my iPad, from anywhere. It works beautifully over a cellular connection. If I want a little television on in the background while in my office, the iPad becomes a second television. It is also great in the kitchen. The iPad is just as capable as a second-screen device. There are two ways that DISH helps to bring out that functionality. The first is with its Explorer app. 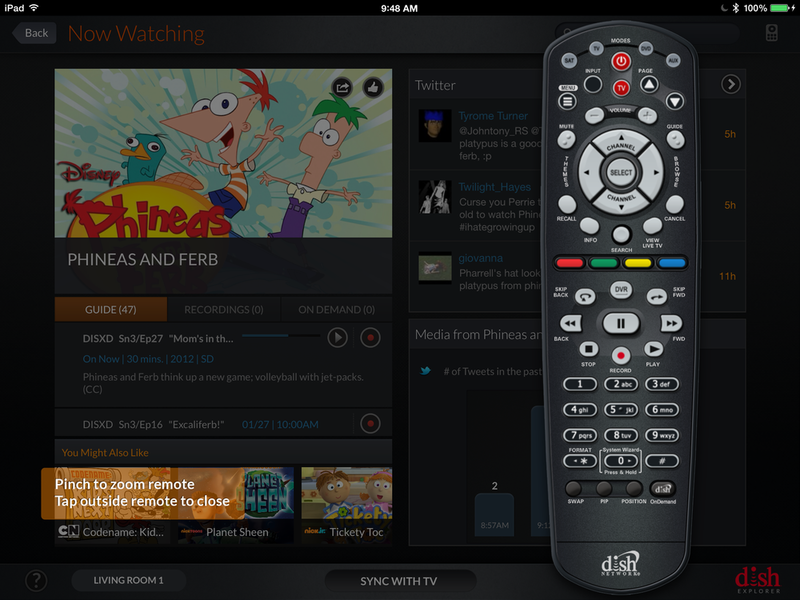 DISH Explorer is the app you use when you want to your iPad to be the remote control. It works over wifi. Think of explorer as an interactive guide. Not only can you see what's on offer at any given moment, you can interact with the information. Tapping Play on the iPad instantly retunes the TV to that program. If you see something that you want to record later, just press the Record button for that program. In addition to the guide, you also have access to all the content you have recorded, along with specialized content categories such as Sports or Movies. If there is something on TV worth watching, Explorer helps you find it. At the bottom of the screen is a button marked Sync with TV. Instead of changing the television to what's on the iPad, it changes the iPad to what's on the television. From there, you can get further information about the show, including recommendations for similar programing. The right side of the screen is reserved for following Twitter comments about the current program. You can also find statistical data about those viewing the show at that moment. You can enter the conversation by using Twitter and Facebook, depending on your settings. Finally, you have complete control of the viewing experience on your iPad. Every screen of DISH Explorer has the ability to launch the remote control, giving you access to all of the functions normally found on the DISH remote: a beast in its own rights. Every button and function is accessible from your iPad. Other cable providers have iPad solutions for accessing and interacting with content. However, the DISH offering is more extensive, and technically better in every way. The Hopper with Sling is the best set-top box since TIVO. Nothing else even comes close. With this combination, my iPad is a no-compromise TV that comes with me wherever I go. I cannot recommend this combination of technologies and services highly enough.